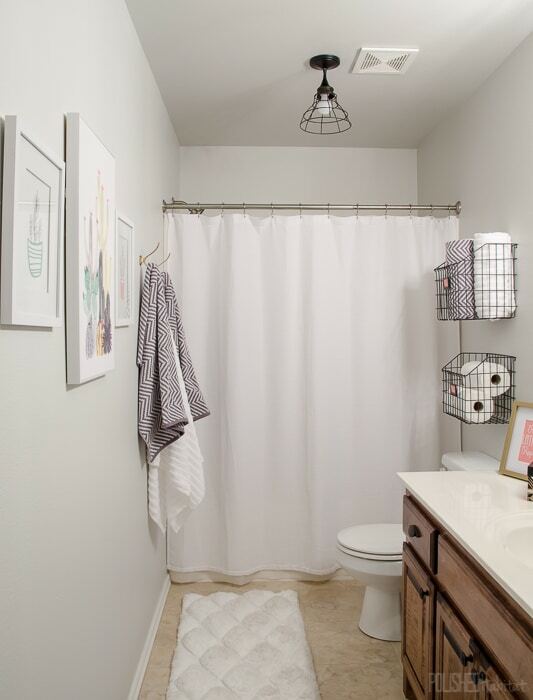 You are here: Home / Organizing / Guest Bathroom Part 2 – It’s Organized! 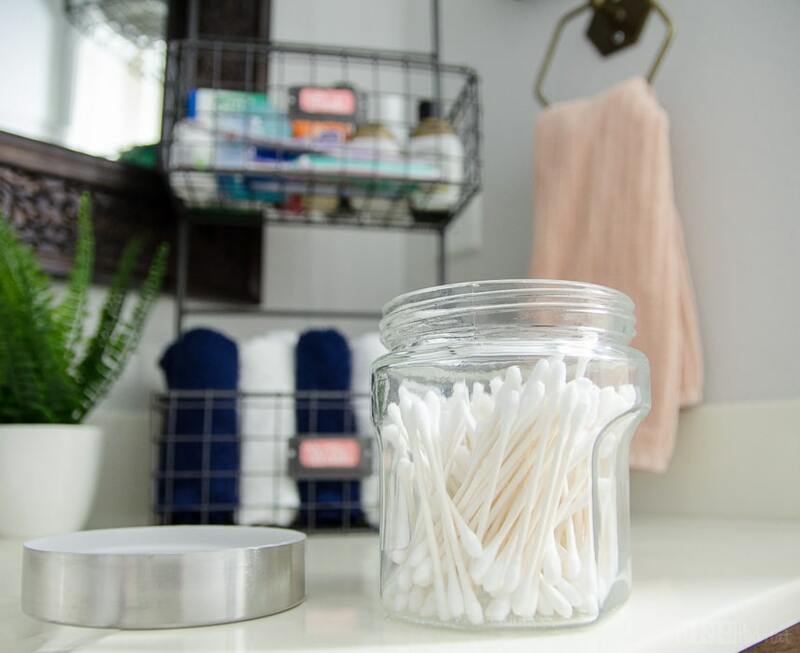 Guest Bathroom Part 2 – It’s Organized! Hooray! After 5 years of bad beige and dysfunction, our guest bathroom is looking so much better. Even more exciting, guests will finally have everything they need in one spot. 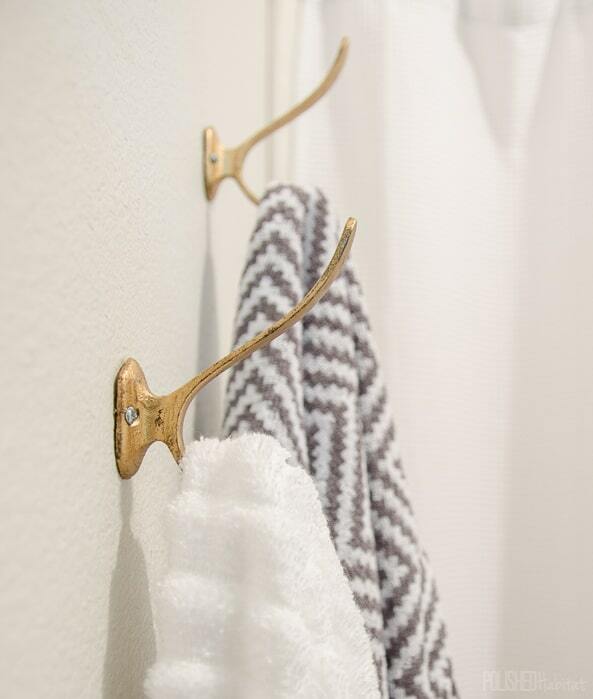 No more having to remember to grab a towel from the linen closet or using the shower curtain rod as a towel bar. 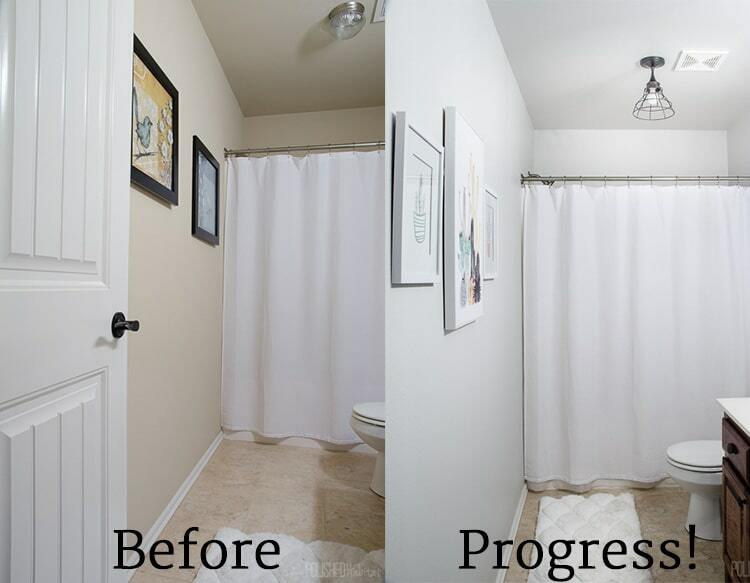 Last week, I showed phase 1 of this quick 2-day bathroom refresh. We updated the paint, lighting, and art for $200. Here’s what that progress looked like. The next part was the most fun! Hobby Lobby challenged me to organize the full bathroom for under $100. I needed quite a few things, so I wasn’t sure how the budget was going to work. I shouldn’t have worried. Between sales and their awesome 40% coupon, I actually came in UNDER budget. The coupon is easy to print from the link at the top of their website, or you can pull it up on your phone while you’re in the store. I’ve saved so much money with that option over the years! I’ll do the full budget breakdown at the end so we can skip to the pretty pictures now. Here’s the same view from above with the organization added. So much better! 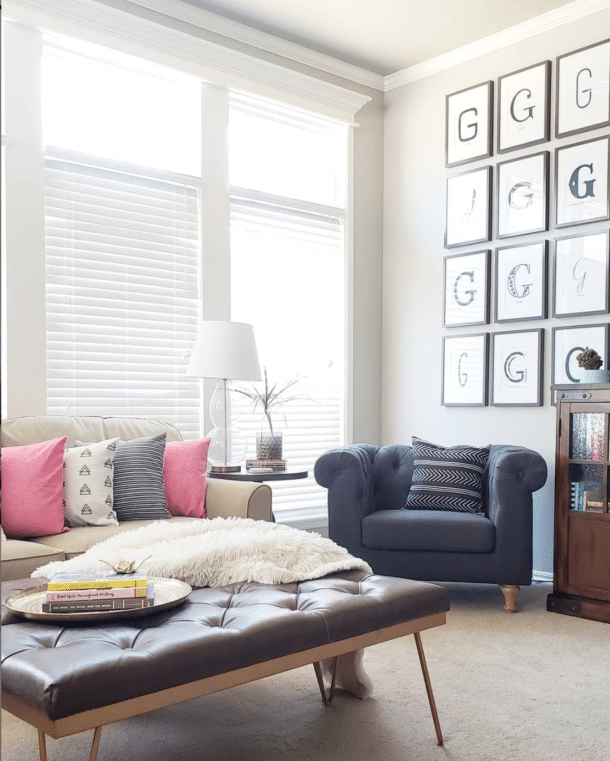 On the left wall, three gold hooks are making all the difference. 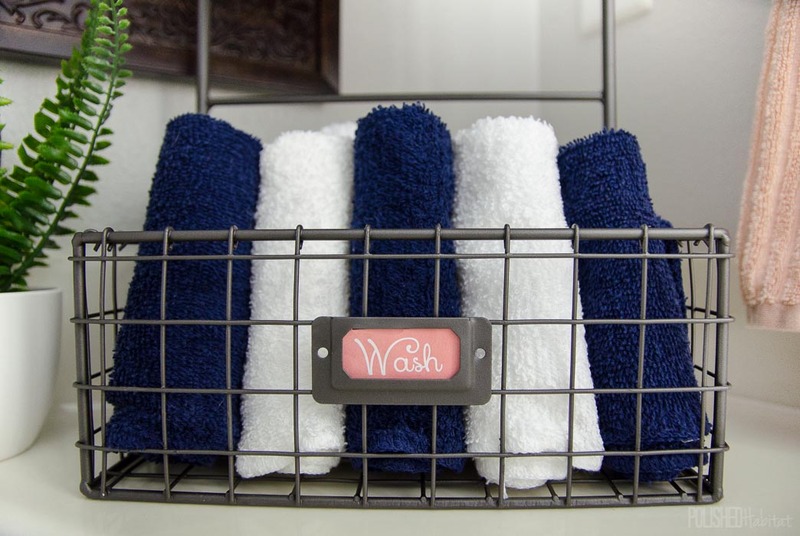 Guests will actually have a legit place to hang towels. What a concept! I know I said I’d talk money at the end, but I can’t get over the fact that these metal double hooks were on sale for $2.50 each. 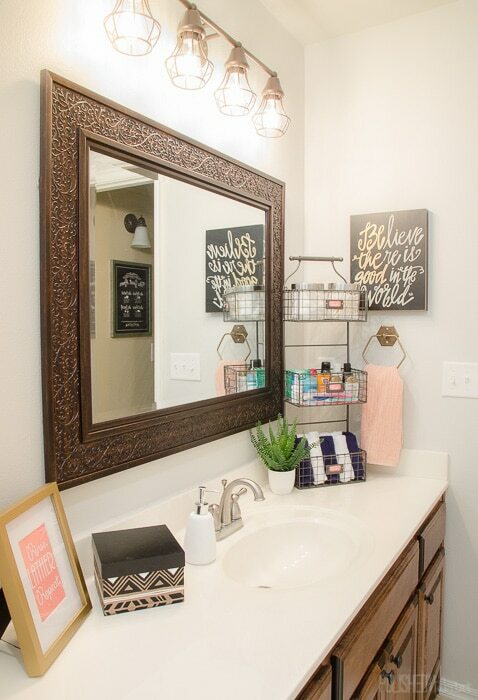 I’ve been thinking about adding hooks next to the bathtub and shower in the master bathroom, and never thought to check Hobby Lobby. I’ve seen these for $10-$12 in other stores. Now that I know I can get them for less than a coffee, they’ll be my go-to hook. Above the toilet, I needed something that looked better than our old shelving AND actually worked. Here’s a reminder of what we had going on before. The new version makes me pretty giddy. I never thought I’d think spare toilet paper was “cute”, but that’s the word that comes to mind. The wire baskets complement the industrial feel of the lighting we added last week. I love that they have built-in label holders. You guys know I’m all about a cute label. I printed the labels on regular copy paper after making them in a simple word processing software. The TP basket is a little bit smaller in both width and depth. It worked out best on the bottom so the headspace above the toilet wasn’t obstructed. Continuing to spin around the room, the vanity is finally full of function. I found a cute tribal print box that I’m using as a mini-medicine cabinet for guests. The biggest addition to the vanity was a three tiered organizer. It holds so much stuff in a small footprint! 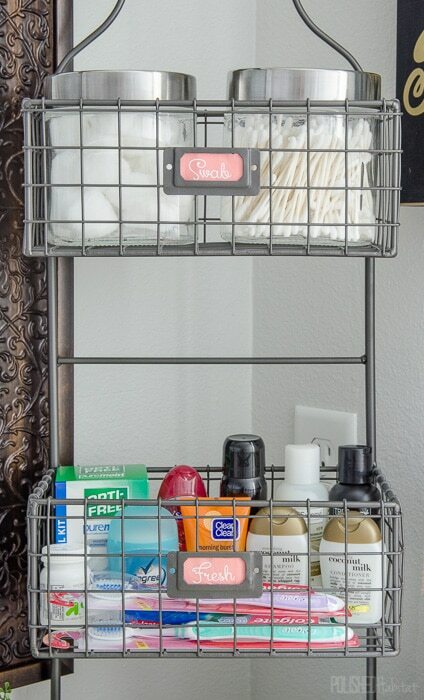 If you didn’t have room on top of your vanity for this organizer, it would be just as handy mounted on a wall. In the top tier, I used inexpensive glass jars from the craft section of Hobby Lobby for cotton balls and swabs. The middle level was perfect for all those items that it’s easy to forget when you are traveling. I should probably add in some kid’s size toothbrushes for the nieces and nephews as well. 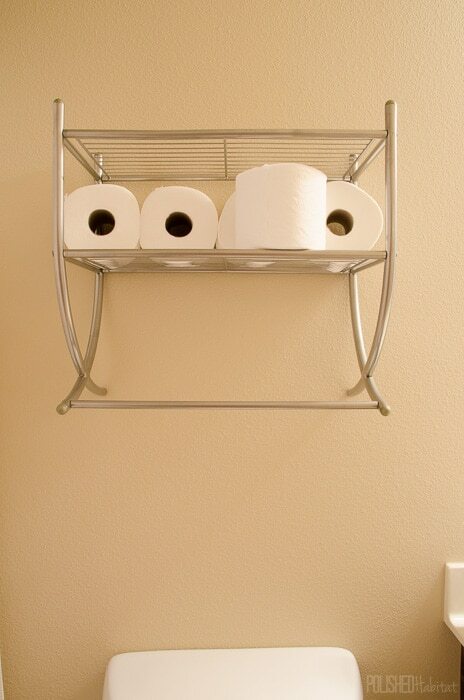 The bottom level gave me the perfect spot to store washcloths IN the bathroom instead of keeping them in the linen closet across the hall. I’ve been the person staying somewhere and realizing you don’t have a towel or washcloth AFTER you’ve already undressed, so this new “stuff IN the bathroom” arrangement makes me feel like such a better host. I think this corner of the bathroom finally gives off a pampering vibe instead of a pathetic vibe. Here’s how the $100 budget played out. I should haven’t been worried about the budget at all! It was a huge help that every item I purchased was on sale the day I went shopping. If it hadn’t been, I would have used the 40% off coupon on the three tier organizer to get it for $36 versus the full price of $60. I’m so glad Hobby Lobby asked me to work on this challenge. I can never be reminded enough that you can make your least favorite spaces much better for less money than you think! I love it, everything looks so nice and love how well thought out it is. Thank you, Marty! I’m so happy that it both looks better AND functions better now. The new look is wonderful and at a terrific price! I’m encouraged and inspired to tackle my bathroom project now. What a difference $79.00 of attractive organizational items can make! Your guest bathroom looks so nice, now. I love it! 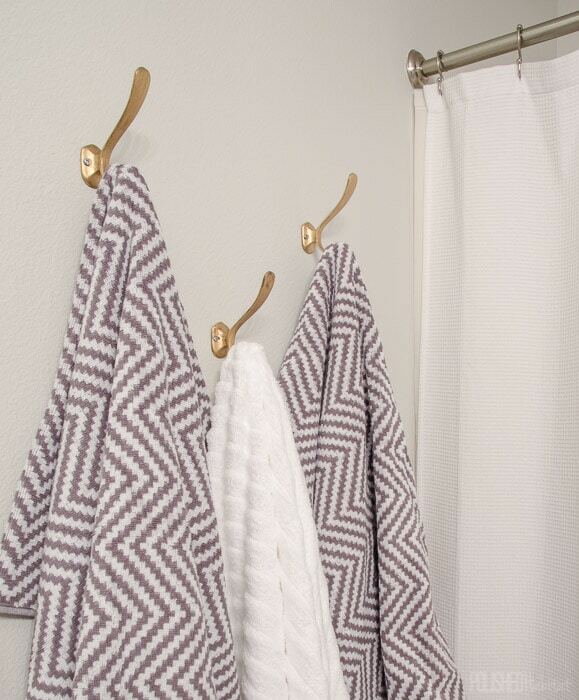 Where did you buy the gray and white chevron towels? Thanks Jaime, those towels were the best deal! Can you believe I found them at WalMart? They are on a stupid-good sale right now (like I wonder if they are getting discontinued?). 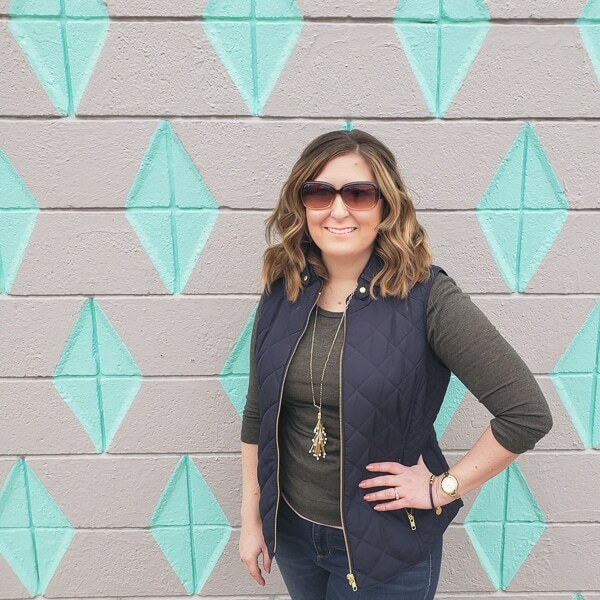 Here’s my affiliate link right to them: http://rstyle.me/n/ceyckrb5wxf if you want to check them out! Walmart?! They are so cute. I’m heading to the website now to buy some. Thanks for getting back to me!! 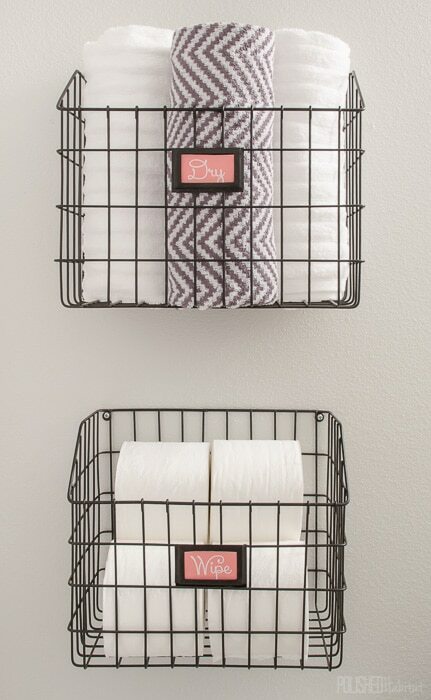 I looked at hobby lobby site and d idnt find those towel/tp baskets. Ideas of where to get them please? Hi Chris, Oh bummer, I wish they still carried them! I did a search and found some similar on Amazon at a good price for you here: http://amzn.to/2Cgl5NH (affiliate link). Happy shopping! We might! It’s definitely been discussed off and on for both this bathroom and the master. I love the towel holder! I’ll have to check out hobby lobby – I wouldn’t have expected that there. And for $5! And just because i happen to notice you like Gilmore Girls, I wanted to tell you I just named my daughter Rory :). Thanks for the post! I was a bit surprised (and delighted) by that find too! And yay for a Rory in the real world! I always think that it should have taken off as a great baby name.